In order to set up my mod, you copy the REZ files to the "Custom" folder in your NOLF 1 folder (create it if there's no "Custom" folder) and then select advanced, custom when opening the game and load the mods normally like you would any other. For the fixing of texture glitches you have to set model chrome to off, which can be found under options, advanced, display once you open the game. And with that, you're done. Normally unusable weapons, also replaced, will appear in both single and multi player modes, although you might need to use the cheat "mpkingoftehmonstars" in chat in single player to get some normally unusable ones. Version 1 has 4 more weapons but glitches key bindings for some unknown reason which I'd love to find out and fix. Version 2 has 4 less weapons but doesn't bug your game. The coin and the lockpick couldn't be replaced for technical problems, the camera disabler doesn't have anything that would fit in its place, the bacalov corrector texture still glitches after turning off model chrome, the camera doesn't even show up and some sounds are still the originals or mute. That is all I think. Installation instructions: - copy all content from zip file you your NOLF game folder. Unzip the zip file and place the PIGranny.rez into the NOLF custom directory ("nolf\custom"). 1). Click the Advance button. 2). Click the customize button. 3). Select PIGranny.rez by clicking on it. Next press the Add button located in the middle of screen. Next click the OK button. 4). Click the OK button back on the Advance Options screen. 5). Finally click the Launch button. Rights: All game content is the property of Monolith Production and Fox Interactive. The P.I.Granny story is the property of Michael Turner. Stranded2 for NOLF- The information in this html was written for AvP2's Stranded2 that I made. It was featured in PC ACTION magazine in June. This is a BETA of the same map I have converted to NOLF. Consider this: HARM has taken over Stranded and shot down your helicopter when you went to investigate. Armed with only a revolver, you must gain control of the two spider stations (get the power back on) and call UNITY to come get you. The information in these html's will help you. Nevermind anything that has to do with aliens. Good Luck with this BETA I am interested in game play as far as weapons and health are concerned. If you have any suggestions before this weekend or for the future of Stranded, then by all means email me ga_cody@hotmail.com, or leave me a message at the Glue Factory. I'm always checking the NOLF mapping section regulary. 1 single player level. I did originally plan to have 3 levels, 1 for the start on how Cate got to be in her situation and a level to finish it of, some sort of escape level, but i lost my patience and did not have time. After you install this add-on to the NOLF's Default directory, There is 2 was to play it. If you have you copy of "No One Lives Forever" installed in the default directory you can run it just by clicking the "Last Stand" icon. For advanced users: Start NOLF, click Advanced/customize and load the "Last_Stand.rez" Then Click ok/ok/Launch. This Add-on should not be run for any on-line play. Because some voices and skins have been replaced. It will not help you, only hinder you. -Now handles the initializing of NOLF2 in a much more professional, less "hackish" way. -NOLF ModHandler is now a Mac OSX native (MACH-O) application for better compatibility with Tiger. 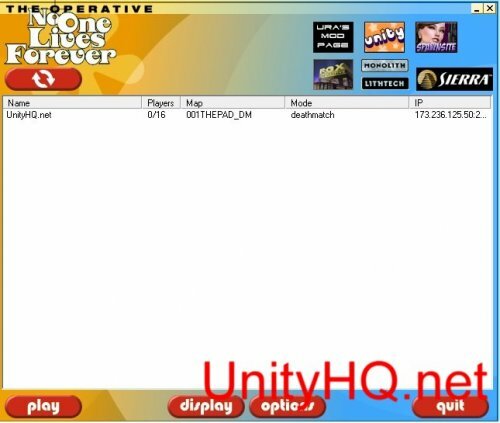 Since Gamespy is dropping support for NOLF1 at the end of May 2014 URA has come up with a great way for people to be able to host servers and connect to them using this tool. NOLF2 based launcher that fetches a server list, query's each server and joins the selected one. A console application that starts NolfServ.exe and adds/maintains/removes your server's info to/from the server list. Note: Do not close Server_Companion directly, stop NolfServ.exe first and Server_Companion will terminate shortly after. That's it! Start up NOLF1 and you should find everything in working order. To open an admin command prompt, open the "Apps" view of the start screen and begin typing "cmd". Right click on the first entry (should be Command Prompt) and select "Run As Administrator". Be sure you are in the same directory as the sdb file. You can use the "cd" command to do this (example: "cd C:\Users\MyName\Desktop"). Go to "Programs and Features" in the Control Panel, select "No One Lives Forever Compatibility Fixes" and select Uninstall. The sdb file is a shim created with the Microsoft Application Compatibility Manager (http://www.microsoft.com/en-us/download/details.aspx?id=7352). It contains an application compatibility fix for lithtech.exe, enabling the compatibility mode NoDTToDITMouseBatch (fixes jumpy mouse movement) and the compatibility fix DXPrimaryEmulation (Parameters: -DisableMaxWindowedMode) (fixes low framerate in fullscreen mode). This sdb will be updated in the future if additional compatibility modes are found to be necessary or helpful. This is Version 2 of the patch. It now has workaround for the firstperson weapon stretching. -Pick supported widescreen resolutions in the display menu, the 16 Bit modes have been removed. -The FOV is Hor+ (the larger the aspect raio, the more is seen). -The cutscenes are anamorphic (they fill out as much of the screen as possible). -The firstweapon stretching is counteracted by scaling them. -The splashscreen and menu backgrounds are no longer stretched. -Subtitles and popup texts now take up the correct screen width. -Circular shadows now actually stay active. Originally they were deactivated after any cutscene played. 1. Put the "WidescreenPatch.rez" file in your NOLF directory. 2. Run the launcher, click on "Advanced". 3. Put this into the commandline field: „-rez "WidescreenPatch.rez"„ (without the outer quotes). 4. Make sure "always pass these command-line parameters" is checked. command line (once again without the outer quotes). 3. Start the game, go to display and select the desired resolution. code because the 1.004 source code wasnt released. (objectives, intel, etc.) from the "Rest and Relaxation" bonus mission of the GotY edition. -The firstperson weapons distort in animations and their movement doesnt match up with the movement of their attachments. This is a result of the streching workaround and cant be fixed. -When using a FOV different from the Hor+ value the firstperson weapons are offseted. This may be counteracted in the future. -The scopes dont scale properly. The scaling is in some weird way dependent on the FOV. This may be fixed in the future. -The sides of the scoped are not covered up yet. This may be fixed in the future. Thanks to Monolith and Gametoast. This is Version 1 of the patch. It has the basic features working. there is no console command to set the aspect. -Changes game version to 1.003 so may impact ability to connect to version 1.004 game servers. of using newly discovered console commands or "cheats". All of this which can be used on a locally hosted multiplayer server so that cooperative play is made possible. PLEASE READ FOR COOOPERATIVE PLAY TO GO SMOOTHELY OR PLEASE READ THE "CONSOLEMOD README.TXT"FIRST TO BETTER UNDERSTAND THIS ONE!!!!!! may find it very easy to become stuck in one of the games many long levels. WHERE TO FIND THE SINGLE PLAYER MAPS?? : You can find these maps to be hosted on your server under the "levels" menu list in multiplayer AFTER you have switched to the "H.A.R.M. vs Unity" Game Type. of levels your server will play, that is obviously the same map/level has the single player game's "Chapter 1 Scene 1: Misfortune in Morocco". confusing. This is why I have simply renamed each one by their proper Mission and Scene NUMBER, in other words Chapter 1 or Mission 1 are THE SAME THING! RECOMMENDED GAME OPTIONS BEFORE STARTING A SERVER: Level ending conditions "none"
half way in the ground but can jump their way free from this bug. to far off the correct area of the map, so make use of joining while a cutscene is playing! is too complicated you can simply have the host of the game press "ESC" and go to "Game Options"
and uses the msg playervehicle0 "activate" command has explained below in the "msg commands"
brings up the console and then quickly press the up arrow and then ENTER on your keyboard. "msg playervehicle0 "activate.....again AND THERE YOU HAVE iT!....PROBLEM SOLVED!...RIDE ON! *NOTE FOR GAME OF THE YEAR MISSION 16: Has to my knowledge, you must own and install the "Game of The Year Edition"
of the game in order for this mission to work, this is why it marked with GOTY before it. ammo types let alone attachments such has silencers. INCLUDED IN THIS DOWNLOADED MOD! multiplayer game, note that these comands also happen to work in singleplayer. end up hearing the main menu screen's music in-game. loop you may have started using the "music play s....command. run the single player version of a map in a seperate window! an object you may want to play around with and edit while in-game. weapon,gadget,mod, or piece of gear like the scuba divers suite. snowy lift riding missions with helicopters shooting at them. the same vehicle. Most common names for vehicles you will find in a map include "playervehicle0" or "playervehicle1". Just like using the console to open doors, pressing f12 on the vehicle your facing will give you the name of that "playervehicle"
when and if you the fans have spare time. SPYDAVE's Showdown sends the indomitable UNITY agent Cate Archer deep into dangerous new territory in pursuit of H.A.R.M. and their latest ally - an enigmatic mastermind of evil. Nine action-packed levels include a subway shoot-out, a hijacked train packed with hostages, a trip to a German brothel and a dramatic showdown against the world's ultimate evil. 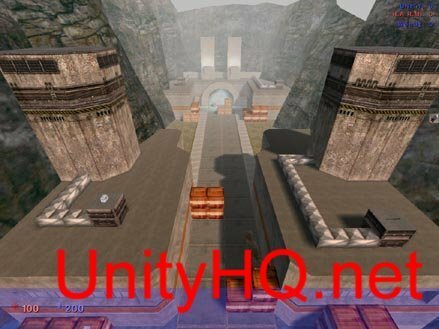 In addition to the single-player levels, Showdown includes four original Deathmatch MP maps designed by SPYDAVE and veteran NOLF mappers Wiky, Deunid, Kyle_Katarn and Coty. then copy the NOLFDLL.REZ file from this fix into your NOLF directory. at widescreen aspect ratios you will see a bit less vertically. The weapon model still appears stretched in widescreen, but the environment does not. circles appear to be circles and not ovals). That being said, the environment looks correct. Using them should allow you to install NOLF to a 64 bit Windows operating system. I found that the installer itself was not compatible with 64 bit systems. The game however is perfectly compatible. I saw on here a lot of people were having trouble and having to jump through hoops like installing on an XP VM. I couldn't be bothered with that so I re-wrote the installer in NSIS. I've tested this on my PC and it works okay, but I'd appreciate others testing it for me. I also wrote a replacement installer for the patch 3. Patch 4 seems to install just fine so I didn't mess with that one. Anyway, the new installer is really simple, currently it only supports English but I am sure it could be modded easily to support other languages. only - and so it was disabled in the retail version of the game. This mod is based on the 1.003 source code. Thanks to blaukanal for sending me the file. Console requires NOLF 1 with update 1.003 or 1.004. 1. Copy console.rez to your NOLF Custom folder. 2. Start the NOLF launcher. 3. Click the Advanced... button. 5. Select console.rez in the left list pane. 7. Click OK twice, then Launch. Note: Remember to remove the mod from the custom list before playing online, or you will not be able to join any games. The console allows the user to interact with the game in a fashion that is useful for map testing & debugging or just playing around. It is possible to adjust console variables, and use console programs, in order to enter diagnostic modes and change playing characteristics. Object editing functions similar to those in my Object Message mod are available. The console will hide in the background until you press the tilde (~) key. Commands are entered onto the prompt at the bottom of the console area. Use the Taunt Manager for NOLF and say goodbye to editting in NotePad or finding out the Taunt you selected does not work. This cool utility lets you easily manage all your custom taunts easily and effortlessly. Modified exe that allows you to play without risking your valuable NOLF CD. Should only be used if you have legitimate NOLF media. This rez file adds about 40 new characters to Nolf1 multi-player. It is in a self extracting Winrar exe file. Run the exe or open it with Winrar. Install the n1cm.rez to your No One Lives Forever\Custom folder. Add the rez file (like a map) on your startup splash screen under Advanced/Customize. will just freeze in its tracks and no alarm will be sounded. the intel case in Multiplayer into the same ammo bright yellow and blew ammo box. This mod places you in an airport as a curious traveler who uncovers an underground military storage area, where you help stop terrorists from intercepting a nuclear warhead. a.. New Voices & sounds. Studios. f.. 8 new levels for you to explore. YouTube play through of this mod.